Henrik Schwarz is an artist in the truest sense of the word and House Masters Henrik Schwarz is his legacy. Comprising 20 of his productions and remixes, the compilation boasts his remixes of Detroit Experiment ‘Think Twice’, Code 718 ‘Equinox’ and Omar feat. Stevie Wonder ‘I’m Feeling You’, as well as his own ‘Leave My Head Alone Brain’, ‘Take Words in Return’ and an album exclusive with Chasing Kurt 'From The Inside' (Henrik Schwarz Deep Version). Schwarz's passion has always been the combination of electronic computer music with instruments and inspirations from other origin. Sound sources from outside the dance world have been melted together with electronic synths and drum machines to create a blast of energy on the dancefloor. Recently voted the sixth best Live Act in the world by the readers of Resident Advisor, which is exemplified by one of the strongest collections of music in the acclaimed House Masters series. Picking out highlights, his remix of Coldcut featuring Robert Owens ‘Walk A Mile In My Shoes’ – which went on to be one of the biggest club hits of 2006 – is included, while ‘Leave My Head Alone Brain’ bridged the gap between jazz and techno. Equally impressive is his version of Ane Brun’s ‘Headphone Silence’, his first record from outside of the ‘dance’ world. House Masters Henrik Schwarz is the 20th edition in the long-running House Masters series which has seen releases celebrating the work of Louie Vega, Dennis Ferrer, Charles Webster and many more. 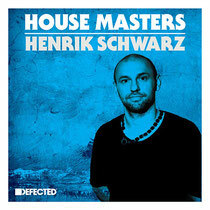 Defected presents House Masters Henrik Schwarz is out 9th February 2014.